TPC’s Site Calibration is pretty amazing. Use any existing calibration as the Site Calibration or create a new one, and TPC will automatically calibrate GNSS data to your survey. 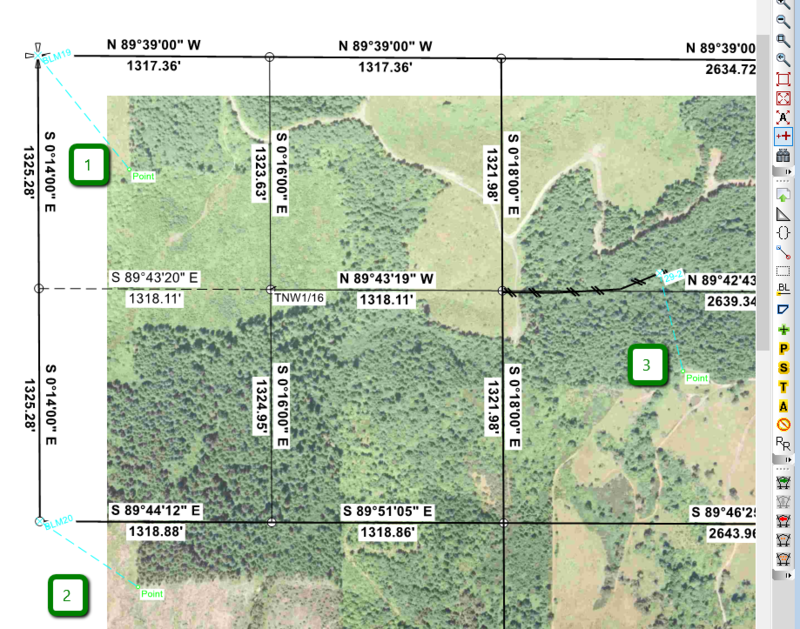 GNSS points always retain their original geodetic positions, but take on calibrated coordinates, so they plot right over the top of your survey and work for all COGO computations like offsets and inverses. 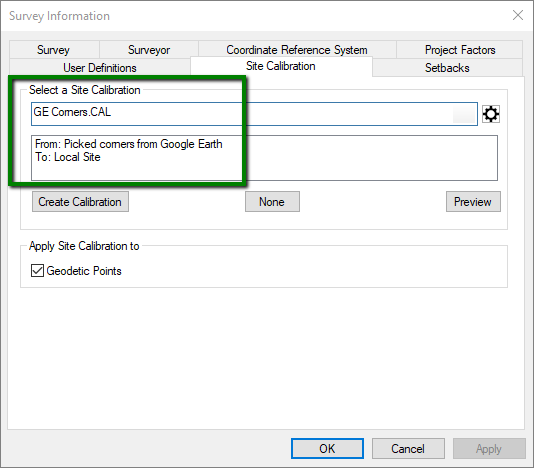 In the example here, we identified some lot corners in Google Earth, imported them into TPC, created a calibration to tie Google Earth to our survey then selected it as our Site Calibration. When you calibrate a photo to your survey, pick as many point pairs as you can find on the photo, then let TPC’s Least Squares calibration routine create the best fit for you. 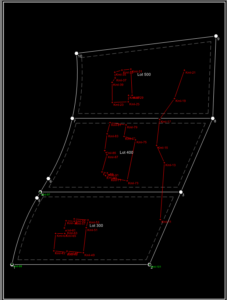 TPC even generates a world file for the photo, so that when you insert it into the next drawing, it comes in at its calibrated position – automatically. We get a lot of questions about how to use background photos in a drawing, and getting the photo to line up just right with the survey used to be a bit tricky. Just pick a series of photo points then those same points in the survey, or pick point pairs like the three shown here and TPC will rock the photo right into place. How many times have to gotten a CAD file that didn’t match your survey? Like the one state plane survey you just sent off to the lighting engineers, only to get the design back at local coordinates 0,0? Or like the drawing shown below, where the XRef is close, but not quite. 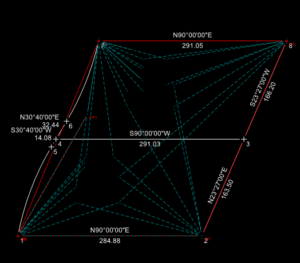 We inserted this XRef into a drawing only to find that it doesn’t quite fit our survey. So we calibrate it. We show the first two point pairs here, so you can see how we snap to the same end of line in the XRef, then the drawing. A few more clicks for a total of four point pairs, or as many as you prefer, and the XRef is calibrated to our survey. And because TPC uses a Least Squares best-fit routine to compute the calibration, you can look at the residuals to see how good the fit really is. 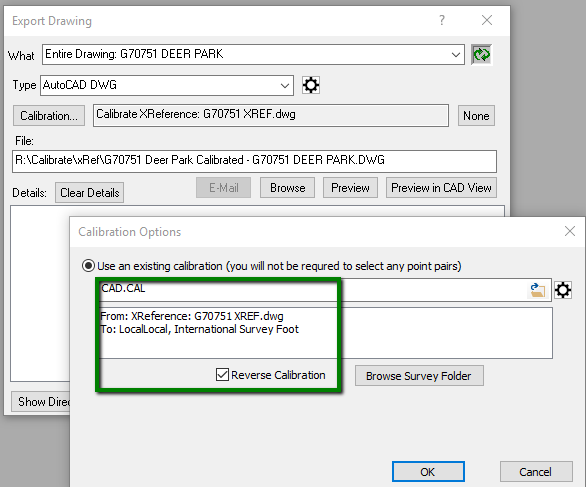 And one you’ve established the relationship between a CAD file and your survey, you can share data between between them using that calibration. 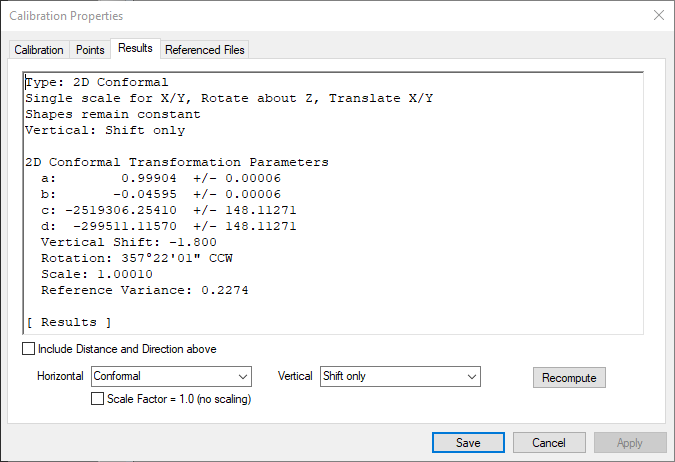 Apply a reverse calibration when writing a new CAD file and it ends up in CAD coordinate system – automatically. 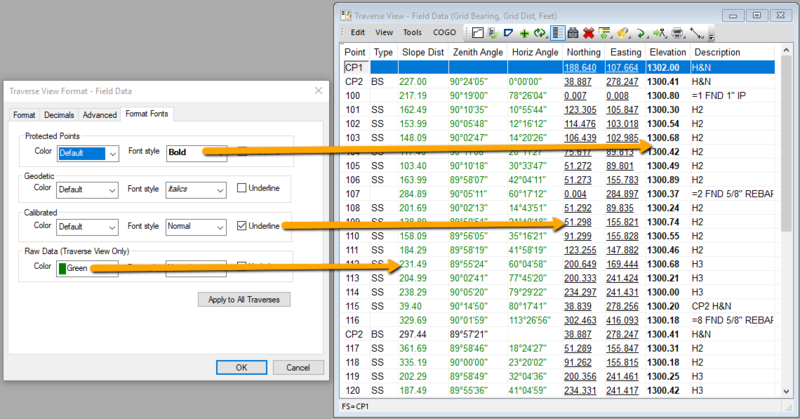 In the example shown here, we calibrated an inserted XRef to our drawing and saved the calibration to the CAD.CAL file. Now, to export a new CAD file to the same coordinate system used by the original XRef file, we just select the CAL.CAL calibration and reverse it. Use the From and To descriptions displayed for the calibration to determine where or not you want to reverse it. 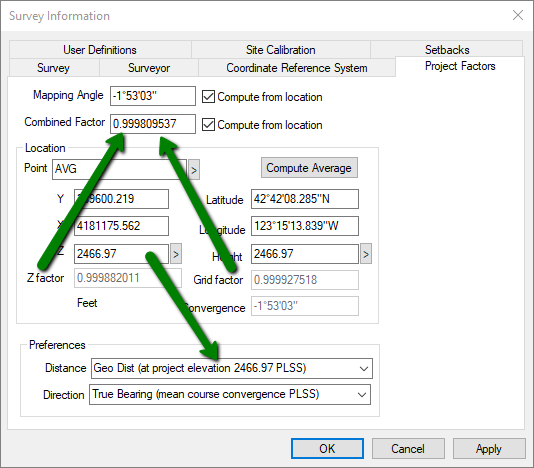 Of course you can have TPC generate State Plane or UTM coordinates based on a Coordinate Reference System, but what about working with a local site survey. You know, where everything is in ground distance at 5000/5000? In the example shown here, we occupied each monument with GNSS (400, 401, etc) then inserted the local site point (400:1, 401:1, etc) as a side shot. That all TPC needed to create the calibration. Of course there are other ways to use traverses to generate a calibration. Just choose the one that works for you. Once we apply the calibration, either directly to the GNSS points or via a Site Calibration, the GNSS points get calibrated to their Local Site coordinates. It’s all pretty seamless and easy to use. 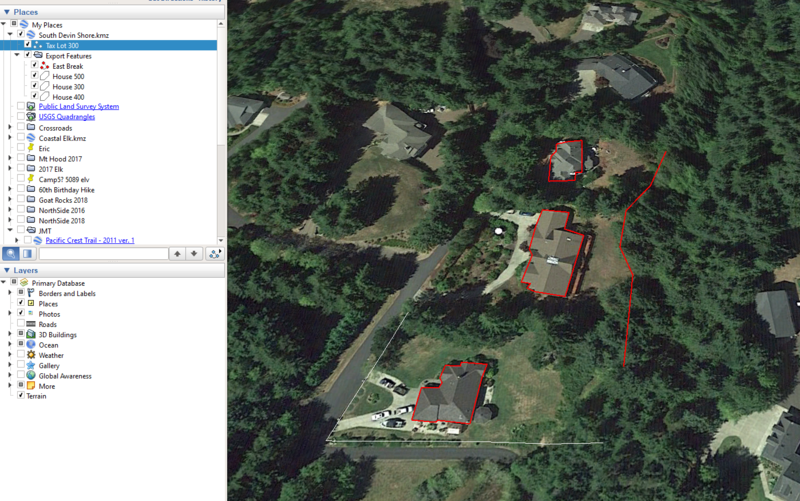 Now you can calibrate total station data based on assumed coordinates and rock it right onto your survey. 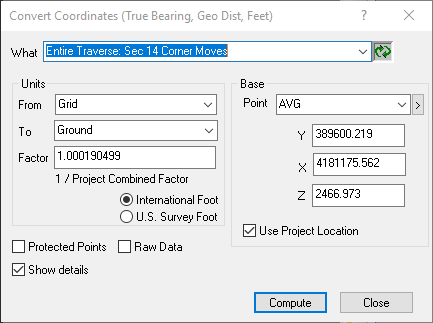 How many times have you started a survey using assumed coordinate system in the field? 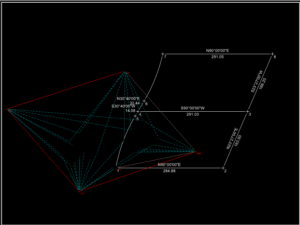 In the example shown here, we just assumed coordinates for our occupied point and backsight. So as you can see, it’s close, but not quite. So now we want to rock it onto the two lots shown in white. It’s easy to do because in the field, we tied a number of the existing lot corners that we found. This gives TPC everything it needs to easily create a calibration using Least Squares best fit for all the tied lot corners. Having a project location documents how you came up with your combined factor and computed ground distances. It’s an easy way to set up your project location one time and then let TPC do the heavy lifting. Here, we’re converting the coordinates in our Sec 14 Corner Moves traverse from Grid to Ground for stakeout. We’re using the Project Location point, AVG, computed from the new Average Point routine, to establish both the base point and the scale factor. Wow, that’s pretty easy. The new Average Point COGO routine computes an average position from TPC’s What list (any points, traverse, drawing objects, etc). In the example here, we’ve selected the each portion of a PLSS section and created an average position. We then used the average position to compute the combined factor for the survey. The average point computation can be saved as a traverse, with all the points included in the computation inserted as side shots from the computed average. You can then open the traverse anytime in the future to see exactly how the average point was created. 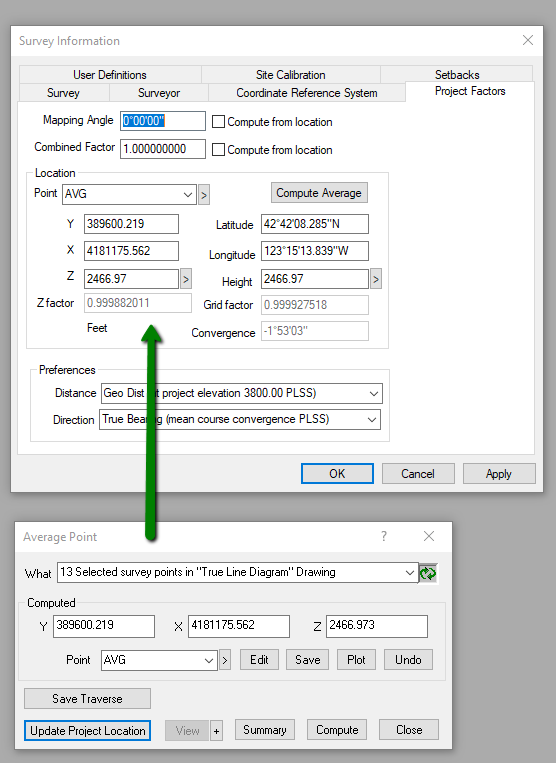 The average point you compute can easily be assigned to the survey’s Project Location. TPC will use it compute the Z (elevation) factor and the Grid factor for that location and even combine them to compute the survey’s Combined factor. You can also use the updated project location for grid<=>ground conversions. 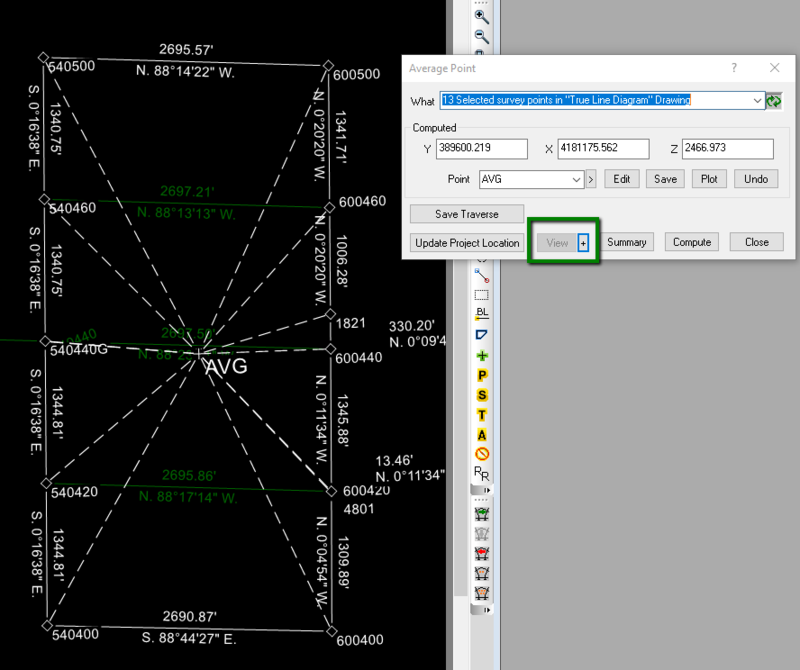 The new View[+] plots any COGO solution over the top of the current drawing. In the example shown here, we’ve plotted the computed average point (AVG) with a side shot to each of the points contributing to the computed average. This is a great way to see how the average fits into the survey overall. The Points Manager and any Traverse View now let you format the data by selecting font attributes (bold, italics, underline) or color. This helps you identify Protected, Calibrated, Geodetic and Raw Data. Traverse PC is a member of the Open Design Aliance. TPC Desktop 2019 includes the latest CAD drivers from the Open Design Alliance, ODA Platform 2019 Update 2.1 released January 2019. TPC uses these drivers for importing and exporting CAD files like DWG, DXF and DGN. TPC now supports the final release of AutoCAD 2018. Includes all the new and enhanced features since the previous version 4.3.2 released December 2017. Includes support for the release version of AutoCAD 2018. Includes all bug fixes since the previous version 4.3.2 released December 2017.